and you sit astride your charger awaiting the Duke's orders. Your men are at your side and ready for a glorious melee. You suddenly spy a group of knights riding out of the Black Forest. Are these the men that the Falcon has promised, or the bandits of that devil the Wolf? Ha! - Sable a wolf's head caboshed argent, a bordure gules. These bandits have chosen the wrong road to travel today. You drop your helm and shout to your men. The battle is upon you! Heraldry as discussed in this article is the recording and regulation of armory. Many historians have their own opinions of when and where heraldry started, and this article won't cover any of those. We strive to merely impart a bit of the rules regarding heraldry, and specifically the blazoning of arms. A coat of arms isn't described, it is blazoned. What you see here is not a coat of arms. It is an achievement of arms. A coat of arms is only the shield shape and the design upon it (though it is not always a shield, depending on who is bearing the arms). Note the aspects of this achievement. On either side you see a supporter; these can be animal or human, real or mythical. The crown at the top of this achievement implies royalty. On top of the crown is a helm, with a wreath, and the mantling, and underneath all, the banner for the motto (if any). For this article we will only discuss the shield - the part that is the actual coat of arms. A coat of arms consists of a field and one or more charges. The field is the shield itself and forms the background of the design. The charges are everything else on the shield and can be thought of as sitting on top of the field. There are several kinds of charges - ordinaries are the most basic and are mostly lines, stripes, and crosses - subordinaries are mostly simple geometric shapes which represent objects (a star shape is said to represent the rowel of a spur, for example) - other charges are realistic drawings of things and animals. First let's talk about the most common devices used in heraldry, then we will describe how they all go together to make a coat of arms. There are only seven colors (tinctures) commonly used in blazoning a coat of arms. They consist of five tinctures and two metals. The metals represent the precious metals of gold (Or) and silver (Argent). There are also a number of patterns, called Furs, the most common being Ermine, Ermines and Vair - shown below. When the tinctures are used together the basic rule of thumb is to have the Tinctures stand out. The original purpose of arms were to enable easy identification, so they needed to be as simple and unmistakable as possible. For this reason, the Rule of Tincture is that a color should not be placed on a color, nor a metal on a metal. There are exceptions (the arms of the Crusader Kingdom of Jerusalem, gold crosses on a silver field, are the best known), and the rule is relaxed for certain kinds of objects and patterns. In addition to the commonly used tinctures and metals, there are also several lesser known colors used, while they are mentioned here, they will not be represented. They are Tenne (tawney or orange), Sanguine (blood red), and Murrey (a purplish red). These are called stains, and were not used as frequently. The field can be partitioned according to several measures, the most common are shown here. Patterns are another way to set the fields apart. Not shown are Semy; a scattering of (as in a Semy of Fleur-de-Lys), Fretty; a woven knotlike background, and Wavy- sounds like what it is, the Barry pattern, but looking like waves. Ordinaries are the original basic charges of heraldry, and are large geometric shapes stretching to the edge of the shield. There is usually only one kind of ordinary on a coat. Many ordinaries have corresponding diminutives, which are smaller versions of the ordinaries. It is not uncommon to see multiples of the diminutives, or the diminutive combined with the ordinary. The ordinaries can be patterned and can have other charges placed upon them. The diminutives are exactly like the ordinaries - but smaller. Diminutive, get it? Subordinaries are another kind of charge. They are usually geometric shapes or simplified drawing of objects. They can be different sizes and colors and are usually contained within a division, but can also be placed on an ordinary. We won't attempt to define them all, but we will mention some of the more common. There can be multiple subordinaries on a coat of arms. Some kinds of subordinaries are large and normally overlay the rest of the coat (like the canton and gyron, bordure and tressure, the label and the fret). Others are smaller and are usually placed on the field or on other charges. In addition to those mentioned above, there is the orle (a bordure set in from the edge), flanches, points and gores (pieces on the sides and corners - the flanche, particularly, looks as if someone has taken a bite out of the shield), and the rustre (a lozenge with a hole, more common in Scotland than England). The eldest son (during the lifetime of his father) bears a label of five points; the second son, a crescent; the third, a mullet; the fourth, a martlet; the fifth, an annulet; the sixth, a fleur-de-lis; the seventh, a rose; the eight, a cross moline; the ninth, an octofoil. A younger son of a younger son places a mark upon a mark. Thus the ninth son of a ninth son would place an octofoil upon an octofoil. Charges are placed pretty much anywhere on the coat of arms. The can be on a field, an ordinary, or a subordinary. There can be multiples of charges. Almost anything can be used as a charge. Caboshed - The head of a beast borne full-faced, and without any neck showing. It has been cut off. Couped - Said of an animal having the head or any limb cut clean off from the body. Langued - Tongued; having the tongue visible. Applied to the tongue of a bird or beast when of a different tincture from that of the body. 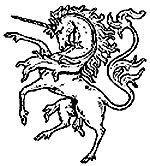 Rampant - Said of a beast of prey, as a lion, rising with fore paws in the air., as if attacking. The right fore leg and the right hind leg should be raised higher than the left. Unless otherwise specified, the animal faces dexter. In order to keep track of all the designs, it was necessary to describe them in words. The art of Blazoning was developed for this purpose. 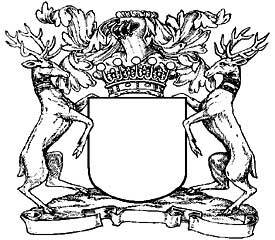 The rules of blazoning make it possible to completely reconstruct a coat of arms just from the written description. 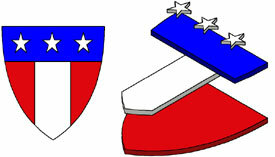 In blazoning, the top of the shield is the "chief" the bottom is the "base". Right is "dexter" and left is "sinister" Right and left are described from the bearer's point of view, so what would be on the knight's dexter appears on our left. Please note that the word "sinister" only applies to the "left" side of the shield, there is no dishonor attached to a family which carries sinister elements on its coat of arms. A coat of arms is blazoned from the bottom up. First you describe the field and all it's divisions, furs, patterns, etc. Then you describe the ordinaries, and if there are charges on the ordinary you describe them here. Then you describe the subordinaries if there are any, and the charges on them if there are any. Then you describe any other charges. Notice that the Rule of Tincure has been followed, since the azure (blue) chief does not really touch the gules (red) field because they are separated by the argent (white) pale. Whew! Still with us? Good! Now after all that we have a treat. We will blazon the LEGO® coats of arms as used by the different factions. Now it becomes apparent that the two shields on the left are related by blood, possibly two brothers. The same holds true for the Black Falcons on the right. There were four factions fighting in the kingdom at this time. Alas all records were destroyed in the calamitous attack of the Dragon Masters in 1144. Of course this refers to those factions that came from the mountains in the west, and out of the black forest. It also includes the new strains of the Blood Royal. The authors would like to thank Anthony Sava for the great work he has done on drawing all the LEGO® faction shields. The information here barely scratches the surface of Heraldry and we had a hard time deciding what to include and what to gloss over. Feel free to contact us for any advice or questions that you may have. And of course further reading is always recommended.